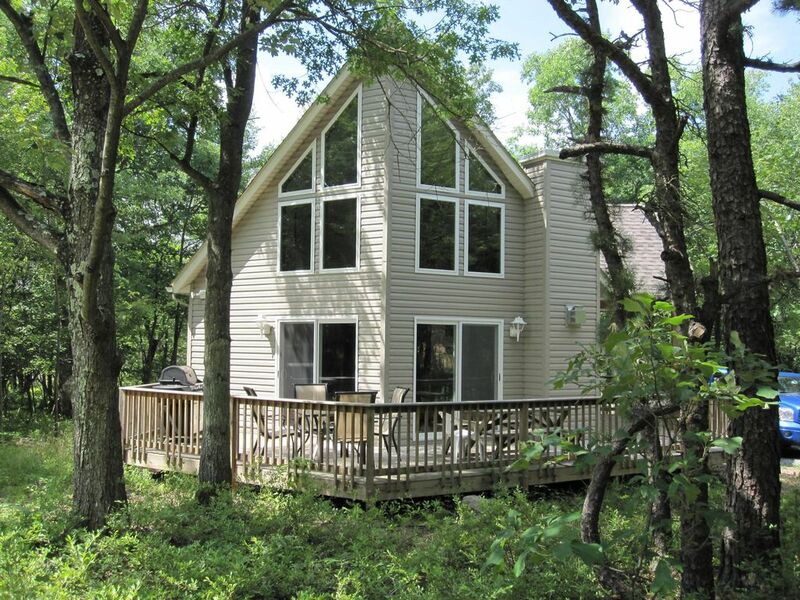 New chalet style house on lovely secluded, wooded lot. The house has as a prow front living and dinning area. Fully stocked kitchen with counter seating for four. High top dinning room table that seats six. Great room has 46' HDTV with a blu-ray player and a gas fire place. It has four bedrooms, three downstairs and one large master suite upstairs. It has two full baths, one downstairs and one upstairs. Upstairs master bath has separate toilet and shower, from the double sink and jetted tub. There is a covered deck at the front door. The deck wraps around to the back. There is outdoor seating and a gas grill. The house is located in the wonderful community of Towamensing Trail. Towamensing Trails is 2900 pristine acres, with a 195 acre lake which has 3.5 miles of shoreline. This fabulous lake has a large sandy beach for swimming area and sun bathing. There is a Clubhouse which features a restaurant, a Summer snack bar, a game room with pool tables, and video games, Next to the clubhouse is the outdoor pool and children's pool. Just below is the sandy beach swimming area at the lake. And too, you will find tennis courts, basketball courts, numerous hiking trails and playgrounds. Just 10 minutes from Big Boulder/Jack Frost Ski area, Lake Harmony and Split Rock resort which offers movies, bowling, restaurants, and taverns. Split Rock now has a indoor water park. Also Hickory Run State Park which has many hiking trails, a beach lake and Boulder Field. Just 15 minutes from downtown Jim Thorpe. Also there is Penn's Peak for a concert, or stop in to their restaurant which has amazing views. Rental Requirements: Rental Requirements: $250 security deposit on all rental. Minimum age rental requirement: 25. Proof of age required for lease. Copy of drivers license required. Credit Card payment through HomeAway or Pay Pal. There is a $5 charge per vehicle registration paid directly to Towamensing Trails. Cleaning fees are not charged if the house is left in the same condition when you arrived. Renter must bring bed linens and towels. Bed linens can be supplied for $75.00, but not towels. Choose from a variety of activities or just sit back and relax! All beds have pillows and comforters. Bed Linens can be provided for an additional $75. House has Wi-Fi. The house was nice enough, clean and quaint. However it is quite old and needs a bit of attention. The first morning, the oven stopped working. When I called to let the owner Paul know, he said he would get right back to me to see if someone could come take a look at it, as this apparently had been an issue before. I never heard back. The following day, the toilet stopped flushing. I texted Paul again, and he said he would try to come take a look. There was a huge lag in responses, so our group ended up having to rig the broken chains in the toilet ourselves! (There is only 2 bathrooms and we had 11 people.) Overall, our group had a great time, but the kitchen is very old, there is next to no silverware available so bring plastic ware, the beds are pretty old and uncomfortable so beware there. My biggest issue was the lack of communication with the owner. I’ve had much better experience with other owners in the past. I am sorry things where not working for you. This rental was over the New Year holiday, so it was difficult to have someone come out to look at the problems. So I said I would come out to look at it. When I call to say I was coming you said you fix it. The appliances in the kitchens are fairly new. The refrigerator was brand new. You were the first to use it. The dishwasher is less then a year old. .The stove is the oldest, maybe 5 years old. The stove was working when we check it, and has work for rentals after you. I am not sure what you were doing wrong. I did fix the toilet with new components. The house has two full sets of silverware. You should not had a problem there. Once again, I am sorry you had any proplem at all. The house was nice and the neighborhood was quiet. The setting was nice, the home suited our needs except the appliances are old. There is a note cautioning renter not to use the microwave and toaster oven at the same time which will cause the circuit breaker to flip and the refrigerator will go off. We followed these instructions, however, our milk and foods spoiled by the end of the week. It is hard to read the dial on the toaster oven to operate, symbols are worn. The water and ice dispenser does not work on the refrigerator, freezer was fine. The home was clean and tidy but needs a good spring cleaning to remove cob webs from lighting and ceiling. Not a great summer rental, no air conditioning. Fans in every room helped. The home owner was contacted and compensated us as we left early due to food spoilage. We chose this home because our sister also owns a home in Towamensing Trails. It was very convenient for our family reunion. The house is lovely and well-maintained, and the daily visitations from the deer were an added plus. It is located very near to Jim Thorpe and other attractions. Because we were flying in from different locations, there was a constant debate on how many rental cars would be needed. Mr Ladow was very patient while we soldified our plans. Unfortunately the message was confused at the community office. The employee there is not pleasant, and obviously sees tourists as the enemy. Luckily our encounter there was brief, and we did not use any more of the community facilities as our reunion kept us busy. All in all a great trip. What a beautiful home. Plenty of room. Quiet, Deer, turkey. Paul thr owner was awesome. There is parking for several cars. Very close to hunting, fishing, rafting, paint ball, shopping, skiing, snow tubing, snow boarding, mountain biking, and hiking. Near the elevated Penns Peak for panoramic views of the mountain side, dining and concerts. Pocono Raceway race car events are only a short 8 minute drive away. Also near Lake Harmony, which is a short drive to restaurants, taverns and dance clubs. Close to the Historic Town of Jim Thorpe will provide several attractions for all ages to enjoy. Minutes from Hickory Run State park, great place to go running, hiking or mountain biking. For the shoppers, there is the Country Junction (worlds largest General Store), the outlet and antique stores all within 25 minutes. There is also plenty of golfing in the Poconos and surrounding areas. Credit cards can be accepted through Homeaway. Also we can PayPal with a 3% processing fee. Ask about our last minute specials. Holiday rates may be higher $250. refundable security deposit on all rentals. I do not charge a cleaning fee if you leave the house in the same condition as when you arrived, clean. Cleaning fees start at $75. Pet fee: $100. per rental. There is a $5.00 registration per vehicle.